We’d love your help. Let us know what’s wrong with this preview of Claws of the Cat by Susan Spann. To ask other readers questions about Claws of the Cat, please sign up. Claws of the Cat is a historical mystery set in 16th century Japan. I don't remember where I first heard of it but a mystery starring a Jesuit priest and a ninja detective was hard to pass up. Spann clearly researched the 16th century Japan setting but at no point did I feel like the book suffered from research-itis. There were no infodumps and the introduction to the period customs and culture was fairly painless. The setting was integral to the plot, what with honor, inheritance, and etiquette playing big parts. Hiro and Matteo were an interesting pair, the Jesuit priest and the shinobi pretending to be a ronin. I thought Hiro would take center stage but they shared the top spot for the most part. Hiro handled all of the sneaking around but Matteo played his parts well. One thing I really liked is that Spann didn't write Hiro as an unstoppable death machine. He relied on stealth and subterfuge but I got the idea he could handle things if they turned physical. Another thing I liked is that Father Matteo tried to live as a Japanese person rather than surround himself with Western trappings. The suspects were a diverse mix and I am embarrassed to admit I didn't guess the killer until it was too late. Hideyoshi's family was an interesting bunch, as was the crew at the tea house. Once everything was laid out, I have to say I was very impressed with Susan Spann's debut. I had a few gripes but they were minor. With all the talk about arquebuses, I was hoping someone would get shot at some point. Also, I wouldn't have minded Hiro getting into a scrape at some time during the proceedings. All in all, I don't have any real complaints, though. Claws of the Cat was received as a Goodreads First Reads giveaway. It is very rare for me to find a mystery worthy of 5 stars anymore; too many of them follow a cookie cutter pattern. So I was delighted to find that Susan Spann has broken the mold with Claws of the Cat and written an intriguing and fascinating mystery. Spann’s writing paints such a wonderful picture of Kyoto, Japan in the 16th century that the reader feels like they are there. Her characters are real and believable and the intera Claws of the Cat was received as a Goodreads First Reads giveaway. It is very rare for me to find a mystery worthy of 5 stars anymore; too many of them follow a cookie cutter pattern. So I was delighted to find that Susan Spann has broken the mold with Claws of the Cat and written an intriguing and fascinating mystery. Spann’s writing paints such a wonderful picture of Kyoto, Japan in the 16th century that the reader feels like they are there. Her characters are real and believable and the interaction between Hiro and Father Mateo has the making of a “beautiful friendship.” The mystery is intriguing and the action starts with the first page and doesn’t let up until the end. I look forward to future books in this series and am very happy to have discovered this wonderful new author. I highly recommend this book to not only mystery lovers but anyone curious about Japanese culture. I love books that take me to a time and place I know little about and then make that setting utterly real to me. When the author also spins a mystery that won’t let go of me, then I’ve found a great read: Susan Spann’s Claws of the Cat. Spann takes us to Japan during the period of samurais and limited contact with the West. Her two “sleuths” are a most unlikely pair. Hiro, a shinobi assassin (think ninjas for the most part), is living undercover as the protector of Father Mateo, a Jesuit priest I love books that take me to a time and place I know little about and then make that setting utterly real to me. When the author also spins a mystery that won’t let go of me, then I’ve found a great read: Susan Spann’s Claws of the Cat. Spann takes us to Japan during the period of samurais and limited contact with the West. Her two “sleuths” are a most unlikely pair. Hiro, a shinobi assassin (think ninjas for the most part), is living undercover as the protector of Father Mateo, a Jesuit priest who has come to Japan to make converts. Interestingly, in many ways Japan has converted Father Mateo. To the disgust of the only other Westerner we encounter, Father Mateo has “gone native.” Hiro’s honor, and hence his life, depend on keeping Mateo alive and well. He’s been sent on this mission against his will originally, but these two are fast becoming a true partnership of intelligent, quirky friends in pursuit of justice. Unfortunately for Hiro, Mateo views his duties to his new flock as more important than his life. When a samurai is found brutally murdered and everyone identifies the killer as a young woman entertainer whom Father Mateo has converted to the “foreign religion” and whose innocence he insists on proving, things get very dicey indeed. Apparently the son of the victim has the perfect right to avenge his father’s death by slaughtering the supposed killer, and once the priest stands up for the accused, the son decides Mateo’s life should be forfeit also. Two days are all Hiro has to find the real killer and save Mateo—and he’s not convinced it isn’t the woman after all. The politics of the Shogunate, family dynamics, religious beliefs, the role of women in Japan (and a renegade or two just to keep things especially intriguing), Zen meditation, the differing world views of East and West—this entertaining book will fool you with the range of ideas it covers. Spann’s depth of knowledge about Japanese history and culture shines through with great authority and I enjoyed the insights she gave me. Don’t you love getting a painless education while indulging in the best escape of all—a good book? Pick up this book for a read you won’t be able to put down. A cultura japonesa, em geral, e toda a filosofia em torno dos samurais é um tema que me fascina. Todo o código de honra, a organização e a ordem desta cultura, tão afastada da nossa, acabam por ser um tema rico para a literatura. Assim que li a sinopse de “O Pecado da Gueixa” fiquei com vontade de o ler. Afinal une história, passado e um crime. Tem todos os ingredientes para chamar a minha atenção. This was an enjoyable mystery and I liked the pairing of Hiro and Father Mateo though at times a tad bit religious for my taste. I would read the next book in the series to see if the religious vein continues. I confess novels set in Asia, either in China, Japan, India, or Malaysia, attract my attention more than other settings, and I have a tendency to pause and read more about the authors who write them, especially if they are not Asian and were not born into the culture. So when I met Susan Spann a few years ago and heard she wrote Japanese mystery, I just couldn't forget her, for she was not Japanese, to begin with. I was curious to see how she would approach Hiro, the detective who's a shinobi, c I confess novels set in Asia, either in China, Japan, India, or Malaysia, attract my attention more than other settings, and I have a tendency to pause and read more about the authors who write them, especially if they are not Asian and were not born into the culture. So when I met Susan Spann a few years ago and heard she wrote Japanese mystery, I just couldn't forget her, for she was not Japanese, to begin with. I was curious to see how she would approach Hiro, the detective who's a shinobi, commonly known as ninja, and if you are like me, you'll know the word ninja carries a dark undertone in Chinese, which Spann commented in the novel as well. Her shinobi is a limber assassin, skillful at his trade, loyal by his profession, and occasionally opinionated, like many common Japanese men described in familiar fictions. The description of the Japanese culture is controlled at the right amount, the seeds of suspicion and digging are delivered at a calculated timing, and the emotion, even at the most critical moment, never overflows from the well of story. The bond between Hiro and his sidekick, Father Mateo, is endearing. I would compare them to Sherlock and Watson, except Watson does not share Father Mateo's occasional sincere but profound confusion of the Japanese culture. But in that way, Father Mateo comes alive. I was hesitant to read this book at first because I am very fond of all things Japanese and as such, I tend to be very critical of things that are poorly researched or don't live up to my expectations of the culture. This book was very well researched but sometimes I felt that the author was a little overly descriptive for no other reason than to prove that the research had been done. That being said I did like the story line and found the mystery I won this book through the First Reads Giveaway. That being said I did like the story line and found the mystery intriguing. While the book kept me entertained while reading it there was a certain lack of action that didn't have me itching to get back to it while I wasn't reading. The characters in the book are nicely written but I wanted to see more of them. I wanted to really get to know these characters and would have loved to see the author develop them. I was fortunate enough to read this amazing jewel of historical fiction before it went off to the publishers. Ms. Spann's descriptions of 16th century Japan are as as clean as a well-swept bamboo floor and as delicate as a cherry blossom-scented breeze. Hiro, the uh..hero-- of the story is a completely new type of character. A Ninja detective... I mean...Do I need to say more? The relationship between Hiro and his charge, the Spanish Catholic priest, Father Mateo steals the show. And this in a no I was fortunate enough to read this amazing jewel of historical fiction before it went off to the publishers. Ms. Spann's descriptions of 16th century Japan are as as clean as a well-swept bamboo floor and as delicate as a cherry blossom-scented breeze. The relationship between Hiro and his charge, the Spanish Catholic priest, Father Mateo steals the show. And this in a novel which features katana swords, geishas and murder by claw. Do not miss the debut on July 16, 2013! Trust me-- pre-order now or mark your calendars. This is a cleverly plotted mystery and I enjoyed meeting the cast of characters. The unusual setting adds a special layer to the story and I definitely improved my limited knowledge of Japanese culture. I look forward to trying more books in the series. How much do you know about sixteenth century history outside the borders of Europe? If you're like me, surprisingly (and embarrassingly) little. As a remedy, I recommend a just-published historical mystery that opens up the exotic, fascinating world of sixteenth century Japan. Susan Spann's debut mystery novel CLAWS OF THE CAT (Minotaur/St. Martin's Press) whisks the reader away to the land of ninjas, teahouses, samurai and missionaries. Writing with the spare beauty of an oriental flower arrange How much do you know about sixteenth century history outside the borders of Europe? If you're like me, surprisingly (and embarrassingly) little. As a remedy, I recommend a just-published historical mystery that opens up the exotic, fascinating world of sixteenth century Japan. Susan Spann's debut mystery novel CLAWS OF THE CAT (Minotaur/St. Martin's Press) whisks the reader away to the land of ninjas, teahouses, samurai and missionaries. Writing with the spare beauty of an oriental flower arrangement, Spann spins an enthralling tale of murder, jealousy, love and honor whose drama is heightened by the ominous pressure of the imposed time constraint. The well-constructed plot cleverly seeds clues and false leads throughout the narrative, keeping the reader engaged, actively analyzing evidence, and racing to solve the mystery in time to save selfless Father Mateo. The ending, although not entirely unanticipated, culminates in an emotionally powerful scene that opposes the Asian notion of honor with that of Western justice. Beyond its well-wrought plot, CLAWS eclipses the average murder mystery in two other areas: the vibrancy of its historical setting and the depth its characterization. Spann, an attorney with a degree in Asian studies, recreates in vivid and precise detail locales and customs specific to medieval Japan. The reader finds herself stepping through gliding rice-paper doors in a typical Japanese house, strolling paths of raked gravel on the grounds of Buddhist temples, and shouldering crowds on the congested streets of the mercantile quarter. She listens to the song of geishas while drinking ritually prepared tea, quakes in a pit of white sand before the magistrate's desk, and mourns at the funeral of a samurai nobleman. Spann never clogs the narrative with long passages of description or explanation but weaves succinct and evocative sensory and cultural details directly into the unfolding action. The fact that Father Mateo (a Portuguese foreigner who has only been in Japan a matter of months) often needs help understanding Japanese traditions requires native Hiro, the viewpoint character, to notice and elucidate things that he normally would hardly find worthy of mention--all to the great benefit of the reader. Spann reveals just enough of her characters' back history to explain the present action, but never more. The sense that each character has a complicated and intriguing story of his or her own permeates every scene. For example, the reader knows Hiro is a samurai masquerading as a ninja, but doesn't know how Hiro came by such training or why, and by whom, he has been assigned to protect the priest. Likewise, the reader knows nothing of Father Mateo's past in Portugal nor what motivated him to become a missionary in Japan. Even minor characters, such as Ginjiro, the sake-sodden monk, and Luis, the Portuguese merchant who lives at the rectory, promise to tell captivating tales, if given the chance. The reader is on a quest not only to solve the murder but to piece together the mosaic of these hidden lives and histories. Spann's unique characters inspire compassion in their flawed particularity--I even sympathized with the murderer, despite the evil deed! This satisfying novel is as much--if not more--about the relationship of the characters to each other and to their pasts as it is about discovering who committed the crime. Spann dispenses her revelations at times and in doses that leave the reader panting for more. Admittedly, it’s been over a year since I read Susan Spann’s debut novel, Claws of the Cat. The biggest side effect (I know of, at least) of being a reader and writer for a living is that the constant Victoria Falls of new stories, characters, plots, and worlds that submerge my brain tend to make them all jumble and slosh into sometimes indistinguishable tales. Not so with Claws of the Cat. 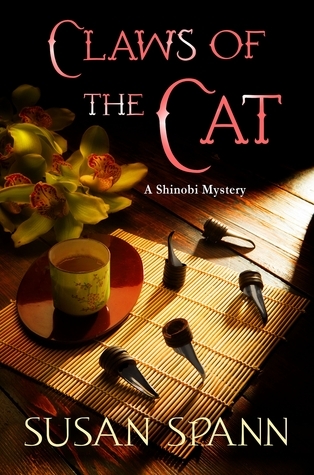 Set in Kyoto, Japan in the fifteen hundreds, Claws of the Cat is a crime fiction mystery and the story of t Admittedly, it’s been over a year since I read Susan Spann’s debut novel, Claws of the Cat. The biggest side effect (I know of, at least) of being a reader and writer for a living is that the constant Victoria Falls of new stories, characters, plots, and worlds that submerge my brain tend to make them all jumble and slosh into sometimes indistinguishable tales. Set in Kyoto, Japan in the fifteen hundreds, Claws of the Cat is a crime fiction mystery and the story of two men, a shinobi in disguise, and his ward, whom he is sworn to protect, a Portugeuse-born Jesuit priest, both drawn into investigating the brutal murder of a samurai in a local teahouse. If the mystery remains unsolved, the price is the Jesuit’s life. Now, you may be saying to yourself, But I don’t know a thing about fifteenth-century Japan. The beauty of Susan’s storytelling is her talent for drawing readers into this rich and culturally intriguing world with delicacy and subtlety, and her stripped-down, dry-witted style is the perfect complement to her equally sharp-as-a-tack and canny main characters, Hiro Hattori and Father Matteo. When you’ve finished reading Claws of the Cat, you will feel as if you’ve taken a minivacation, both in time and place, to old-world Kyoto, sipped tea in the local teahouses of the Pontocho District, felt mud from the streets squishing beneath your getas, barely dodged the lethal swipe of neko-tes wielded by an adept and dangerous kunoichi, and plotted conspiratorially over cups of sake against the shogunate with other rulerless, wild ronin. In short, this is a whodunnit mystery that will paint your imagination vivid, rare, and intoxicating colors. Don’t miss it! And most exciting of all, the follow-up novel, Blade of the Samurai, is coming soon. This new mystery series is set in 16th century Japan and is full of interesting new words and the culture of the times. The heroes are an interesting pair. Father Mateo, a Jesuit Priest, and Hero, a master shinobi ( what we think of as a ninja), who is sworn to protect the Father. When a samurai is murdered in a local Kyota teahouse, the lovely young "entertainer" calls upon the Father to prove her innocence. The murdered man's son is furious and wants immediate revenge --the death of the enterta This new mystery series is set in 16th century Japan and is full of interesting new words and the culture of the times. The heroes are an interesting pair. Father Mateo, a Jesuit Priest, and Hero, a master shinobi ( what we think of as a ninja), who is sworn to protect the Father. When a samurai is murdered in a local Kyota teahouse, the lovely young "entertainer" calls upon the Father to prove her innocence. The murdered man's son is furious and wants immediate revenge --the death of the entertainer who was the only one in the room with the murdered man on the night of his death. He allows Father Mateo two days to prove her innocent and reveal another murderer. If finds no proof, then he threatens to kill both the Father and the girl. This was a very interesting book. New words were defined in the glossary at the end of the book. The culture of the times makes the detecting much different than what we think of for a modern mystery, with social customs making direct questioning almost impossible. The coupling of a Portuguese Christian Priest with a Japanese shinobi makes for interesting interactions. Knowing very little about those times, I felt myself truly drawn into this well researched and intriguing mystery. Definitely plan to read the next book in this series---BLADE OF THE SAMURI. First in a new series. I really liked the setting- medieval Japan is not the first thing that comes to mind when you hear the phrase "cozy mystery", but there it is. A Portugese priest and his shinobi bodyguard investigate the murder of a samurai at a local teahouse, where one of the priest's recent converts is the main suspect. The writing style is spare, but I had no trouble imagining the setting. Tantalizing hints of Hiro's past are dropped, but frustratingly not followed up on; I am guessing First in a new series. I really liked the setting- medieval Japan is not the first thing that comes to mind when you hear the phrase "cozy mystery", but there it is. A Portugese priest and his shinobi bodyguard investigate the murder of a samurai at a local teahouse, where one of the priest's recent converts is the main suspect. Claws of the Cat is a page-turning whodunit packed with sharp details that take the reader on a journey through 16th century Japan. Spann weaves a tight plot with a cast of unique characters with a deft hand. I can't wait to see how the ninja detective, Hiro, reveals more of his dark past as the series unfolds! Susan Spann has a remarkable ability to inhabit the world of geisha and samurai in sixteenth-century Japan. The presence of a Portuguese Jesuit missionary gives us Westerners an entrée into this closed society, and I like it that we are left, like Father Mateo, to infer the rules governing social interactions. A glossary of Japanese terms at the back of the book is useful in helping to decipher the more arcane references, but I was too caught up in the story to refer to it until I'd finished. Disclosure: Susan and I were on a panel together last month at Bouchercon: "Cultural Immersion: Mysteries Steeped in Different Cultures." Her series sounded so intriguing, I couldn't wait to sample it and now I'm hooked. Well written murder mystery. Likable main characters (Hiro and Father Mateo). We’re in 16th century, medieval Japan. Kyoto. There’s a problem of the retired samurai who’s been violently attacked in a teahouse and left to die, his loincloth so soaked with blood that it is stuck to his hips. His throat is “ruined.” The vase holding hydrangeas is spattered with blood. The suspect list is short. At least, at first. There’s certainly an obvious suspect and there’s a nifty ticking clock—a local magistrate concedes to a few days of grace to figure out who wielded the knife and l We’re in 16th century, medieval Japan. Kyoto. There’s a problem of the retired samurai who’s been violently attacked in a teahouse and left to die, his loincloth so soaked with blood that it is stuck to his hips. His throat is “ruined.” The vase holding hydrangeas is spattered with blood. The suspect list is short. At least, at first. There’s certainly an obvious suspect and there’s a nifty ticking clock—a local magistrate concedes to a few days of grace to figure out who wielded the knife and left such a mess. Honor is stake. Codes govern nearly every interaction. There’s a foreigner in our midst and he’s, well, Christian. Father Mateo is the Portugese priest and his protector is Hiro, a well-respected samurai who is working undercover. Hiro is Father Mateo’s shadow (shadows are a powerful undercurrent to the whole story; so are masks) and the two form an odd pair of detectives who learn to trust each other’s strengths as they pursue their cause with careful logic, shrewd tact and the occasional trap. With its sharp-eyed plot and rich atmosphere, Susan Spann’s “Claws of the Cat” transports the reader back five centuries to a culture of contrasts. With Father Mateo in tow, we see and learn the multi-faceted rules and customs from the earthen street to the halls of power. As others have noted, this is a full-blown immersion into the culture and society at that time. There’s a bit of hand-holding along the way as details are explained, but the observations are sprinkled in as relevant notes for Hiro, Father Mateo or the investigation. Or all three. With her clean, precise prose style, Spann makes the social studies tidbits belong like a blossom on a cherry tree. You’ll want to keep a spare finger or thumb in Spann’s handy glossary and you’ll want to see if you can stay ahead of Father Mateo and Hiro. If you avoid mysteries because they lean toward suspense or cheap thrills, you’ll enjoy “Claws of the Cat” because it respects the reader, lets you play along. The thrill is in spotting every relevant detail and, of course, it’s in the catch. Spann plays fair and gives a good game. Just remember: A shinobi’s first and greatest defense is misdirection. The story opens when Hideyoshi’s body is found in the teahouse, only Sayuri present. The case seems at first glance to be an obvious open and shut: the lovely entertainer is clearly guilty. Father Mateo is not convinced. Sayuri is one of his converts and he cannot believe the innocent girl would be capable of a gristly murder. Nobuhide is infuriated at the priest’s interference and threatens to kill both Sayuri and Father Mateo in three days if they do not produce the real killer. Absorbed in this page-turner, I had no idea how much I was learning about 16th century Japan until I finished the book. I admire the author's skill in achieving this result so elegantly. The reader really does need every bit of this information for maximum enjoyment, and at no time did it ever feel like a tedious slog through unnecessary data, or present me with anything I felt tempted to skip – quite the contrary, I would have been happy to pick up a sequel right away and learn more about this Absorbed in this page-turner, I had no idea how much I was learning about 16th century Japan until I finished the book. I admire the author's skill in achieving this result so elegantly. The reader really does need every bit of this information for maximum enjoyment, and at no time did it ever feel like a tedious slog through unnecessary data, or present me with anything I felt tempted to skip – quite the contrary, I would have been happy to pick up a sequel right away and learn more about this fascinating time and place. Hiro and Father Mateo are ideal foils for each other, very different, but each with strengths that complement those of the other. The secondary characters are also distinctive and interesting. I have mixed feelings. While the book provides a very detailed look at the customs and day-to-today life of feudal Japan, to me the characters sound like they’re from modern times. I was constantly having to remind myself that this was set in the 1500s. If you don’t mind the occasional modern turn of phrase, though, this book offers a satisfying glimpse into a little-known—to Westerners at least—world. Set in the samurai era of Japan, this entertaining book kept my interest from start to finish. The author did a fabulous job of infusing the culture into the story without making it confusing for a Western reader unfamiliar with the setting. I'm a sucker for clean mysteries and odd settings. And it helps that the two sleuths are engaging and interesting. I wish Father Mateo were a bit more fleshed out, but I suspect that it is coming. A well-crafted first book. Great period detail, a solid mystery and smooth prose. Very well researched. A Western priest becomes embroiled in a murder when a young woman he has been teaching about Christianity is the prime suspect, and his ninja companion must help solve the crime to protect his friend. Engaging stuff, and I look forward to reading more in this series. A cultura japonesa está em grande destaque em O Pecado da Gueixa, através da perceção das regras comportamentais de um ninja, Hiro, protetor de um padre português, Mateus, que juntos irão investigar a morte de um samurai, Akechi-san, numa casa de chá e num intervalo do seu entretenimento com a gueixa Sayuri. Neste livro o leitor é convidado a entrar num Japão do século XVI para embarcar numa viagem onde de forma subtil vai convivendo com factos que destacaram desde sempre uma comunidade oriental. A cultura japonesa está em grande destaque em O Pecado da Gueixa, através da perceção das regras comportamentais de um ninja, Hiro, protetor de um padre português, Mateus, que juntos irão investigar a morte de um samurai, Akechi-san, numa casa de chá e num intervalo do seu entretenimento com a gueixa Sayuri. Neste livro o leitor é convidado a entrar num Japão do século XVI para embarcar numa viagem onde de forma subtil vai convivendo com factos que destacaram desde sempre uma comunidade oriental. As regras culturais onde se encaixam a educação e o respeito pelo outro, a honra familiar e os procedimentos entre estatutos são dadas a conhecer de forma leve, sem cansar, neste livro bem encadeado e de forma a conseguir contar o enredo criado ao mesmo tempo que factos e costumes históricos vão sendo demonstrados com a introdução de apontamentos que vão dando a perceção mais exata de como tudo acontecia. Ao mesmo tempo que as aulas de história japonesa acontecem perante um leitor que se centra na procura de um assassino com Hiro e Mateus, a narrativa vai andando, sendo visitados locais por onde os principais suspeitos podem ter passado. Quem será o culpado pela morte de um homem que aparentava tudo ter e controlar quando afinal se torna o elo mais fraco de uma sociedade do querer é parecer, sempre a favor dos costumes e tradições? Gostei da história pensada, no entanto senti que faltou ação no desenrolar da história, existindo ausência de pontos que deixam o leitor curioso com o que vai acontecer a seguir. Tudo se desenrola de forma rápida, não existindo muito espaço para se elaborarem teorias, além de que as personagens não vão dando grandes pontos sobre o que vão descobrindo acerca dos suspeitos, para que o leitor se sinta dentro da narrativa, fazendo com que existam suspeitos e ajudando a criar teorias como é pretendido num bom thriller. Senti a ausência do chamamento perante tudo o que vai sendo contado, vendo falta da revelação de pontos que me entusiasmassem a pensar que o culpado poderia ser determinada personagem para logo a seguir encontrar motivos para mudar de ideias. Certo que sempre desconfiei do verdadeiro assassino desde o início, mas as coisas podiam ser tão bem baralhadas por parte da autora. O que noto é que o trabalho histórico a nível dos factos marcantes da cultura japonesa são bem retratados e de forma leve, mas depois a parte central do que é contado deixa um pouco a desejar perante quem gosta de ver boa ação e sentir que os suspeitos têm motivos para serem os culpados de um crime, mesmo que no final se perceba que só um foi o verdadeiro homicida. Falta acima de tudo uma boa comunhão entre a aula histórica e a criação de cenários por onde senti a ausência de descrição mais pormenorizada, tal como a explicação de como determinadas personagens chegam perante outras ao longo do tempo, principalmente a dupla de detetives inesperada. Existe ao mesmo tempo a introdução de um pequeno gato logo no início do que vai sendo contado, esperando-se que este apontamento ganhe destaque ao longo do tempo, que não passam de dias, mas não, dando quase a ideia que o animal foi inserido para preencher um espaço sem nexo. Qual a necessidade de ser introduzido logo como ponto chave para depois não ter grande relevância? Um ponto que não percebi e que até pode passar ao lado da maioria dos leitores. Father Mateo Alvarez is a Portuguese Jesuit living in Kyoto in the 1500s. Sworn to protect him even at the cost of his life is shinobi and companion, Hiro, who was given this task after an unknown failure in his past life at Iga. Life is relatively quiet for the pair, until one morning when Father Mateo is summoned to a local teahouse where a guest was murdered. The suspected killer is the girl who was entertaining the man, a young woman named Sayuri, but she swears she did not do the deed and b Father Mateo Alvarez is a Portuguese Jesuit living in Kyoto in the 1500s. Sworn to protect him even at the cost of his life is shinobi and companion, Hiro, who was given this task after an unknown failure in his past life at Iga. Life is relatively quiet for the pair, until one morning when Father Mateo is summoned to a local teahouse where a guest was murdered. The suspected killer is the girl who was entertaining the man, a young woman named Sayuri, but she swears she did not do the deed and begs Father Mateo, who converted her to Christianity, for help. Although Hiro would rather not get involved, Father Mateo whole-heartedly believes in Sayuri's innocence and vows to prove it. Unfortunately, the son of the dead man, Nobuhide, is out for blood, and as it is a samurai's right to extract revenge for the killing of a family member, he is all but ready to kill Sayuri then and there. However, he is manipulated to allow Sayuri two days to prove her innocence (relying on Nobuhide's ignorance about the Christian faith), but there is a stipulation that if the real killer cannot be found, then he gets to kill Father Mateo as well. With the stakes set incredibly high, the priest and his shinobi friend set off to unravel the mystery before innocent bled is spilled. Given that this book is set in 16th-century Japan and features a ninja master, I was surprisingly disappointed by how slowly the book moved. Perhaps because it takes place over the span of two days, the author tried to fit too much into the plot, causing it to become bogged down by too many minor events. Also, the constant back-and-forth between the same three places grew pretty boring by the time I was halfway finished. The suspects were relatively limited as well, which allowed for greater development of the secondary characters, but sacrificed depth of mystery; I was all but certain who the murderer was with almost sixty pages left in the book! Is there such a thing as a cozy historical ninja murder mystery? I kind of feel like that is what this book entails. There's a shinobi tasked with protection of a Father Matteo, a Portuguese missionary in Kyoto. One of the father's parishioners, an entertainer in a house of pleasure is accused of murdering a high place samurai in the Akechi family. Father Matteo defends her, and in doing so, angers the son of the murdered man. He is given two days to prove the girl's innocence or be executed alo Is there such a thing as a cozy historical ninja murder mystery? I kind of feel like that is what this book entails. There's a shinobi tasked with protection of a Father Matteo, a Portuguese missionary in Kyoto. One of the father's parishioners, an entertainer in a house of pleasure is accused of murdering a high place samurai in the Akechi family. Father Matteo defends her, and in doing so, angers the son of the murdered man. He is given two days to prove the girl's innocence or be executed along with her. The POV is the shinobi, Hiro, who lives with and protects Matteo. Most of the book consists of Hiro going around talking to people involved in the murder and uncovering a greater web of secrets that touches on the politics of that time period (Just before Oda Nobunaga basically unifies most of what we consider today's Japan). All those bits were interesting. However, the writing style and tone of the story fit more in "cozy" territory than say adventure or thriller because of the kind of matter-of-fact way people interact. Most of Hiro's shinobi skulking happens in the latter part of the book (indeed near the climax when we're about to find out who the murderer is there's a long skulking scene that slowed things down a bit for me and would have been super cool earlier in the book with its references to nuki-ashi stepping and worrying about getting pine sap on his clothing, etc.). There's also very little of Father Matteo, and truthfully, the potential bromance between a shinobi and a priest is way more interesting to me (and i mean platonic bromance, as in, the developing of a deep relationship based on gradual understanding of ethics and culture) than the murder mystery. I wish more conversations between Hiro and Matteo were in the book or at least more of how Hiro came to respect and regard Matteo as valuable in the first place. Primeiro que tudo, a parte mais visível deste livro. A capa. Acho que há muito tempo que uma capa não me encantava desta forma. Lindíssima e muito bem conseguida. Não obstante este livro se poder caracterizar como thriller ou como policial, para mim teve um encanto maior, o de me permitir conhecer um bocadinho da cultura japonesa, das regras sobre as quais viviam os Samurai. Gosto de livros que me levam em viagem por mundos desconhecidos e este era, seguramente, um mundo desconhecido (e que esper Primeiro que tudo, a parte mais visível deste livro. A capa. Acho que há muito tempo que uma capa não me encantava desta forma. Lindíssima e muito bem conseguida. Não obstante este livro se poder caracterizar como thriller ou como policial, para mim teve um encanto maior, o de me permitir conhecer um bocadinho da cultura japonesa, das regras sobre as quais viviam os Samurai. Gosto de livros que me levam em viagem por mundos desconhecidos e este era, seguramente, um mundo desconhecido (e que espero continuar a explorar uma vez que me parece que O Pecado da Gueixa é o primeiro volume duma série de livros com Hiro e Mateus que espero que sejam editados por cá). Junte-se à história um mistério aparentemente insolúvel e temos uma receita de sucesso. The slain samurai's son, who is a local policeman, hears about the murder, and demands revenge for his father on his killer. Father Mateo and Hiro convince him to give them two days to find the real murderer; if they fail, not only will the entertainer die,but so will Father Mateo, lending urgency to the task. A rare murder weapon favored by ninja assassins, a female samurai warrior, and a hidden affair leave Hiro with too many suspects and not enough time. Author of the Hiro Hattori Novels (Shinobi Mysteries), featuring ninja detective Hiro Hattori and his Portuguese Jesuit sidekick, Father Mateo. THE NINJA'S DAUGHTER (Seventh Street Author of the Hiro Hattori Novels (Shinobi Mysteries), featuring ninja detective Hiro Hattori and his Portuguese Jesuit sidekick, Father Mateo.